As I’ve pointed out before, the President can be successfully engaged, and countries like Ukraine, China, and Qatar have demonstrated this. When they want something from the United States, they skip the State Department, and even the White House staff. Instead of approaching their problem state-to-state, they go state-to-man. These countries focus on what Trump wants on a personal level – to enrich his family. So Beijing granted Ivanka trademarks, Qatar invested in one of Jared’s office towers, and Ukraine, with Slavic candor, simply wired half a million dollars to the President’s personal lawyer Michael Cohen. For the most part, the western allies understand that if we want the U.S. to do something we must negotiate with the man himself. What we [Canada] have not grasped yet is, as strange as it sounds, the President of the United States is more concerned about promoting his interests than defending America’s. Until this President, every previous modern occupant of the White House divested their assets upon assuming office. This eliminated the possibility personal business interests might benefit from political decisions. Conversely, it prevented others from threatening the President by attacking those assets. Trump, by refusing to give up his businesses, and by flagrantly violating the emoluments clause, has inadvertently handed us the perfect stick. I propose that instead of taxing the import of American serviettes, we tax Trump. 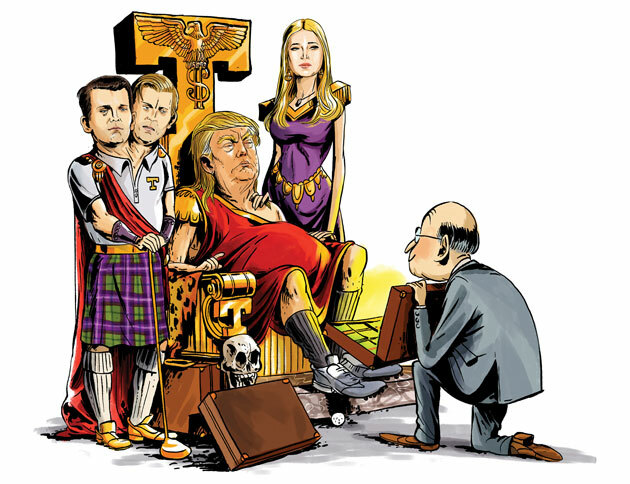 In the spirit of the Magnitsky Act, Canada and the western allies come together to collectively pressure the only pain point that matters to this President: his family and their assets. This could take the form of special taxation on their current operations, freezing of assets, or even sanctions against senior staff. Canada could add a tax to Trump properties equal to any tariff unilaterally imposed by Washington. The European Union could revoke any travel visas for senior staff in the Trump organization. And the United Kingdom could temporarily close his golf course. I recognize this column has the stench of bad satire about it. I am sane enough to know this proposal does not sound sane. But I also know we are confronting an unprecedented crisis and one that would have sounded insane if we’d been warned of it just three years ago: the President of the United States is dismantling the entire liberal international order we have spent a century building, and he is completely focused on promoting his own interests, at the expense of American allies, and at the expense of Americans themselves.